It’s Project Spectrum time again, thanks to Lolly, and the color for the month of May is red. I may have mentioned a time or two that I love red. It’s my favorite color, in fact, so I couldn’t be happier about starting Project Spectrum in this way. 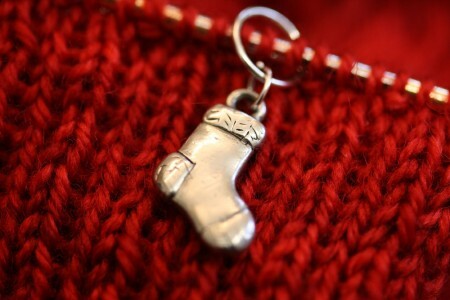 I’m participating by knitting red socks. 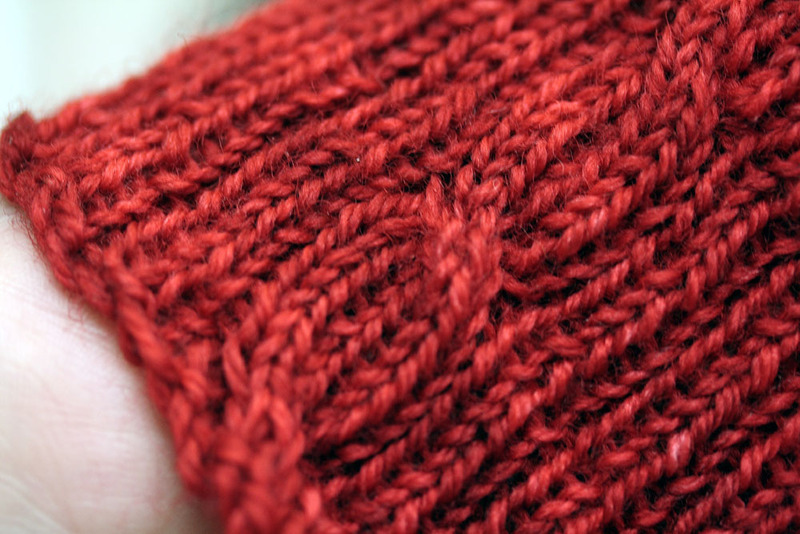 The yarn is Kim’s, the color is Scarlet Devil, and the pattern – don’t fall over now – is Cable Rib Socks. That’s right, I’m knitting a patterned sock. Okay, it’s a pretty simple pattern but I do love the cable running down the sides of the leg. It’s also, thanks to Maryse, Macro May. I’m participating by taking macro shots with lots of red. 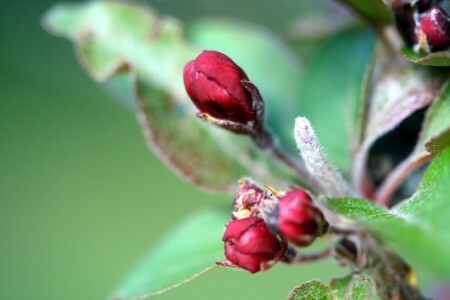 Like this one of my crab apple tree blossoms. And this one of my wee sock stitch marker. Hooray for Project Spectrum! Hooray for Macro May! Love the idea, yarn and stitch markers!! 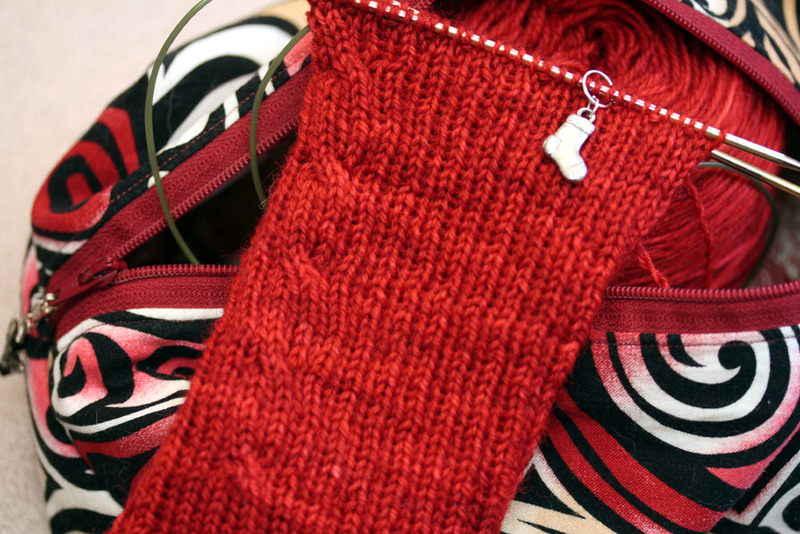 Where did you find the stitch markers? This is a lovely post to look at!! Red is such a festive, romantic, passionate color! Cabled socks are lovely and will be fun to wear. Great photos! Scarlet Devil!!?!! 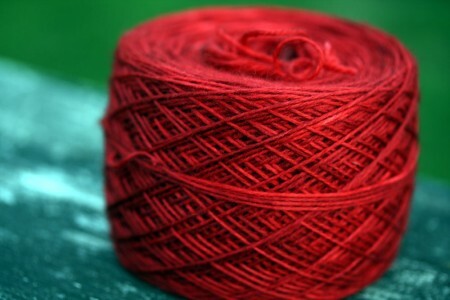 OMG, I love that color and had no idea Kim dyed yarn that red! Love the cables, too! Love that red! Some reds are just too yummy to resist. Red was my mom’s absolute favorite. She often wore it from head to toe, including lipstick, red leather jacket, and red boots! She was a character, and now I love wearing a bit of red to make me think of her! 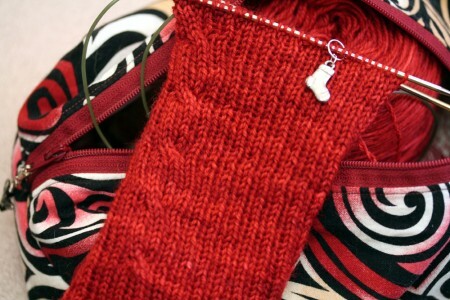 That is just the cutest little stitch marker and the yarn is a fabulous shade of red. Good looking sock! Who doesn’t love a cable? I really need to get caught up on blogs… red runs a close second to purple with me, especially a robust, rip-roaring red such as you are flourishing today. It’s a great season for macros too, what with spring bustin’ out all over. It is a beautiful shade of red! I just finished a pair of these in a lovely slightly variegated brown. I love the fit and the look of them! hurray! i love red too. What??? No picot edge? I love your picot. But I think I might love your red cabled luscious socks! Egads!! Simply stunning.